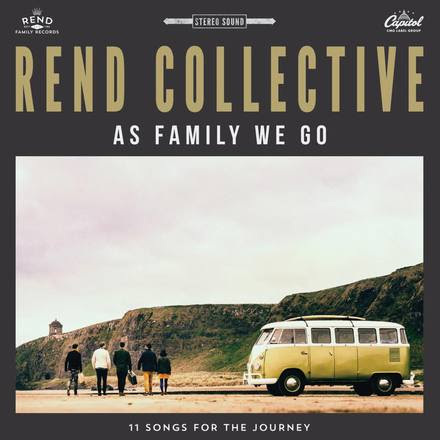 Rend Collective is known for their dynamic live worship, and their upcoming August 21 release, As Family We Go, has captured that same energy and spirit.Claiming neither folk or indie rock, this celebration band continues to reinvent the “soundtracks” to their ministry, pushing further into new instrumentation and sounds. The upcoming release will bring 11 tracks of worship music, while a deluxe version of the album will offer two brand new songs, two remixes and one ukulele track. The band recently explained the meaning of the title As Family We Go in a post to fans. “Part of the title comes from the fact that we always have considered ourselves less as a band, and more like a family…We pray as a family, work as a family, and do ministry as a family,” the band wrote. The group hopes to capture the heart behind As Family We Go by asking others to share their own personal family and community stories. People are able to post pictures, stories, prayer requests and encouragement online using the hashtag #AsFamilyWeGo and tagging Rend Collective. The band will check and share stories daily. As Family We Go is Rend Collective’s fifth studio record, but it’s the group’s first release with new label partners, Capitol Christian Music Group. As Family We Go follows their 2014 release The Art Of Celebration, which debuted at No. 1 on Billboard’s Christian & Gospel Chart. Previous albums also saw success with singles such as “Build Your Kingdom Here” and “My Lighthouse” breaking into the top 25 on the National Christian Audience Chart. Along with their album release, the fall will bring a busy touring schedule for Rend Collective, who will once again join GRAMMY® Award winner Chris Tomlin on the second leg of his “Love Ran Red Tour.” Known for their energetic and celebratory worship, the band joined Tomlin earlier this year for spring dates and will take part in his Worship Night In America events in New York City’s Madison Square Garden, Denver’s Red Rock Amphitheater and Sacramento’s Sleep Train Arena this August. A full touring schedule is nothing new for Rend Collective, whose energetic worship draws sold out crowds across the globe. The group led worship at 150 events last year alone, and with a strong international draw, made recent stops in Brazil, Hungary, Switzerland, Hong Kong and Canada. 2016 is already shaping up to be a busy year for Rend Collective as they gear up to hit the road for two headlining tours.For additional tour information, visit: http://rendcollective.com/tour.